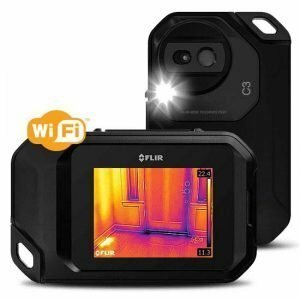 The FLIR E75 is a thermal imaging camera with lenses that are calibrated automatically. It comes with a series of lenses that work without being first calibrated by FLIR. €7,099.00excl VAT€8,731.77incl VAT Free Delivery! 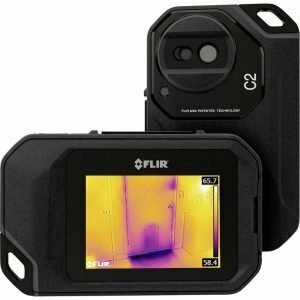 The FLIR C3 is a compact thermal camera that fits in your pocket and enables you to carry out a variety of work, including facilities maintenance, building inspections, electrical repair, and HVAC. Use it to find plumbing issues, cold air leaks, hot fuses, and more. €799.00excl VAT€982.77incl VAT Free Delivery! 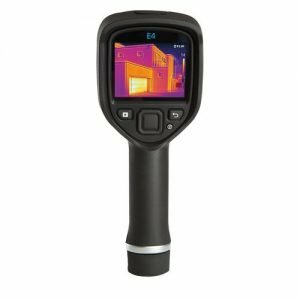 The FLIR C2 is a step up from FLIR ONE – this is the smallest standalone thermal imager. Ideal for use when conducting building surveys but can be also very handy for maintenance contractors. The Pocket size means that the device is easy to carry around and does not occupy too much space. €699.00excl VAT€859.77incl VAT Free Delivery! 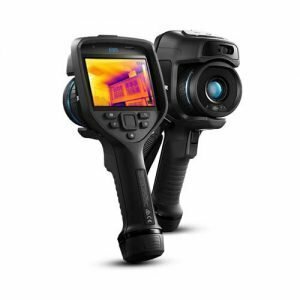 The FLIR E8 is the ultimate in the Ex-Series Range of Thermal Imaging Cameras. Equipped with 320x240px sensor and 9MHz frame rate it provides accurate images. The instrument is focus free so does not require adjustment. Just aim and shoot. €3,995.00excl VAT€4,913.85incl VAT Free Delivery! Equipped with built in Wi-Fi module, the FLIR E40bx is excellent for team work allowing to send measurement results quickly and effectively. The FLIR E50bx Thermal Imager offers good specs for reasonable price. Thanks to the MSX Technology and Scalable Picture-In-Picture mode it is possible to capture important details of the scene and blend picture from normal 3.1MP camera with the thermal image. €5,495.00excl VAT€6,758.85incl VAT Free Delivery! The FLIR E60bx allows to take 3 independent measurements simultaneously and the MSX Image Enhancement mode allows to capture important details that otherwise would be lost like labels, symbols, numbers and object edges. €7,495.00excl VAT€9,218.85incl VAT Free Delivery! Designed for ease of use and comfort, the FLIR T420bx is a smart, high quality tool that allows to measure temperature signatures with great accuracy. The specific software utilities make it easy to report, share and collaborate. €8,495.00excl VAT€10,448.85incl VAT Free Delivery! The FLIR T440bx allows to preform variety of amendments to the produced image on the go using filters, MSX enhancing system, built in reporting software and allows to send results through Wi-Fi quickly and with no hassle what so ever. €9,995.00excl VAT€12,293.85incl VAT Free Delivery! Bursting with a large amount of useful functions, the FLIR T600bx is one of the most advanced Thermal Imagers currently available on the market. The exceptional built quality, ergonomics and superb hardware are the additional benefits. €15,995.00excl VAT€19,673.85incl VAT Free Delivery! 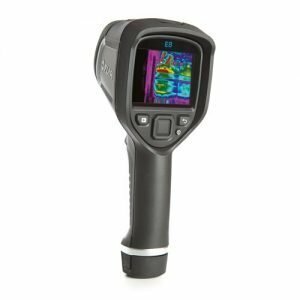 Built with advanced users in mind, the FLIR T620bx is a professional instrument capable of delivering stunning results. Capture all details of the surface that you take the heat signature from. State of the art software will help you to process, annotate and share measurements results.